Perfect battery operated puck lights for Kitchen, Closet, Cabinet, Bookcase, Utility Room, Jewelry Display Case, Basement etc. Measures approx 2.36*0.79in and weighs 0.97oz for each lamp, can be placed anywhere even small corners. Made of high grade 6063 Alu material and PC milky material, durable and simple. 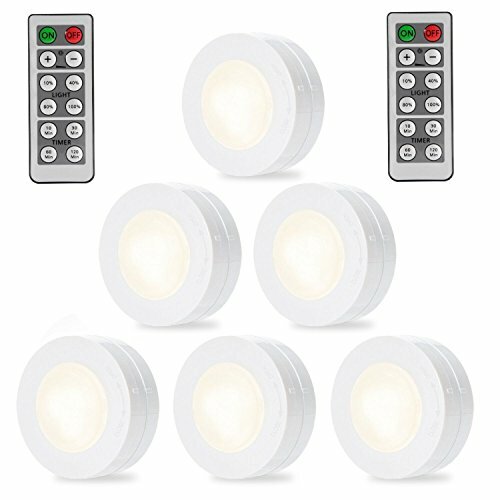 2 CONTROL MODE: Turn the led puck light ON/OFF with the remote or press dome button manually. DIMMABLE: 10%, 40%, 80%, 100% brightness. If you don't want the batteries to run quickly, please use 10% or 40% brightness. TIMER PRESETS: Set the puck light to turn off in 15, 30, 60 or 120 minutes. 60 LUMENS: Bright and light lasting, 4000K natural light. BATTERY POWERED: Powered by 3*AAA batteries(not included), 10% brightness last 100 hours. If you have any questions about this product by SOLLED, contact us by completing and submitting the form below. If you are looking for a specif part number, please include it with your message.